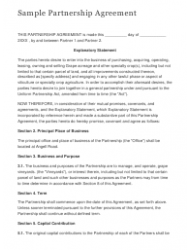 A partnership agreement is a written document used to formalize a relationship between two or more business partners. The agreement - otherwise referred to as a "Partnership Contract" or the "Articles of Partnership" - is necessary for individuals who decide to run a for-profit business together. 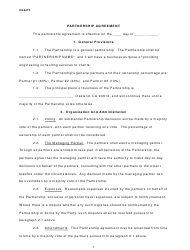 Business partners use the partnership contract to map out the goals of the partnership and to define its terms to avoid any disagreements in the future. This contract can be created before establishing the company or after the partners have already worked together for some time. When establishing a partnership agreement, business partners should carefully outline its rules and their responsibilities to ensure clear communication between all parties. Business partners share the ownership of the company and are equally liable for its obligations and debts, as well as for the actions of the other members of the partnership. A formal agreement outlines the voting power of each partner, the distribution of profits and losses, and sets rules for financial reporting. 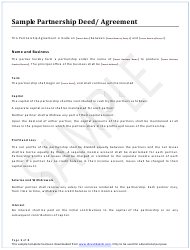 This 12-page sample document contains a full Explanatory Statement between two partners. The parties in this document enter into the business of either purchasing, acquiring, operating, leasing, owning or selling a product. Another example of a Partnership Dissolution Agreement between two business partners. Apart from purchasing price and obligations clauses, the template includes clauses on indemnification, taxes and governing law. 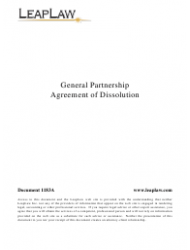 This template demonstrates a General Partnership Agreement of Dissolution based on a legal document. It is important to note, however, that it does not replace professional legal advice or other expert assistance. 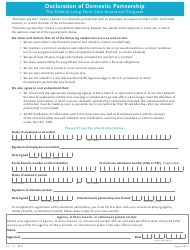 This is a Declaration of Domestic Partnership template from a federal long-term care insurance program. A “domestic partner” is defined as a person in a committed relationship (domestic partnership) with an employee, annuitant, member of the uniformed services, or retired member of the uniformed services. 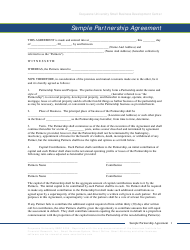 This Partnership Agreement is a 6-page template for a Small Business Development Center at Duquesne University, Pennsylvania. This is a typical agreement for small businesses, discussing clauses such as capital accounts, cash distributions, banks and books of accounts and such like topics. A partnership agreement is a contract between two or more individuals, corporations, trusts, or partnerships that join together to carry on a trade or business. This five-page document discusses various provisions in cases such as death, bankruptcy or retirement. 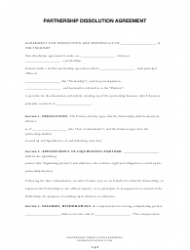 This is a more detailed legal document template called Partnership Dissolution Agreement. This partnership is formed under a written partnership agreement that takes up 4 pages and concludes with a clause on successors. 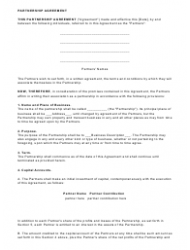 This is a general partnership template based on a City of Oakland, California document. 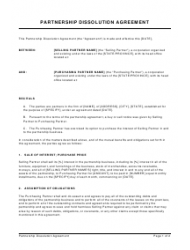 This template gives an example of an agreement between three partners, whose business purpose is to provide engineering consulting services to clients.